The real issue is that women are usually our own worst enemy. We don’t support diversity of lifestyle within our own gender and don’t acknowledge that some of us are living with situations that the luxury of “choice” never even factored into the equation… yet we are judged anyway for it. 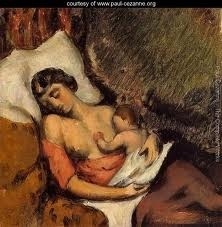 A great example of this is the breast feeding debate. There are some babies who no matter how dedicated the mommies are just will not accept the breast. What is that mother to do? Starve the child? No! Give that baby a bottle of course. Another example is the working mother… There are those families who, no matter how attached a mother is to her newborn, cannot afford not to have two incomes or the woman makes more than the man (it’s the twenty-first century, HELLO! )…what should she do…scale back with another mouth to feed? What I’m saying is, there is a story behind every family and every decision and though it is not transparent to the transient observer it doesn’t make it any less present. When we as women stop shaking our heads and tsking our ladyfellows to their faces and behind their backs it will give others, including the media, less opportunity to sensationalize and make it possible for others to overtly sexualize something that should not be. Isn’t it time? Aren’t we ready to teach our daughters–and our sons–that shaming each other doesn’t work? If we don’t nobody else will. As for my thoughts on the TIME cover (if you are curious), well, I’m not using it in my post for a reason but it’s not the reason one might think. I believe Ms Grumet–the nursing cover mom–probably had enough of being judged, condemned and vilified for nursing her son and saw this as an opportunity to shine a light on a subject that was important to her. I believe her motives were good ones and that this issue is one we should be discussing. Unfortunately the photo was so polarizing that the dialogue became about THIS WOMAN and three camps–attacking, sexualizing or defending her. It’s really too bad. My own experiences while nursing were quite diverse. I had mom friends who were very supportive and most of us breastfed our babies well past their first birthday if not until their second (yes, one friend did it until her son was past three). I remember being at a shopping center with my daughter, she was maybe 9 or 10 months and I was nursing her in a lounge area. I was covered, nothing exposed and a gentleman passed me suggesting I take my activity to the restroom. “Do you eat in the toilet?” I asked. He dead-panned and walked away. I also had other friends and family who did not support my decision to nurse as long as I did and they made snide comments and remarks that I largely ignored…but I remember thinking at the time that It would never occur to me to make a judgement on their decision NOT to. When I stayed at home with my first child, I heard condescending remarks from working women, things like “I don’t know how you can do that all day,” or “I just decided I needed to set an example…” And then when I returned from maternity leave and was a working mom after I had my second child I heard just as much criticism from women who said things like “I couldn’t imagine anyone else raising my child,” or “Nothing was more important than my family.” Very nice for you, for all of you. Really. Truly. Here’s the good news ladies, no matter what life you’re living there are opinions for/against it either way. What we need to do is stop being detractors for ourselves and maybe others will follow suit. What do you say? This entry was posted in Thoughts and tagged Biggs, breast, breastfed, breastfeed, children, family, feeding, Grumet, home, Housewife, Infant, Jamie, Jason, Jason Biggs, lactation, leave, magazine, marriage, maternity, media, Moms, mother, motherhood, newborns, nursing, parenting, parody, Time, weaning, women, working.